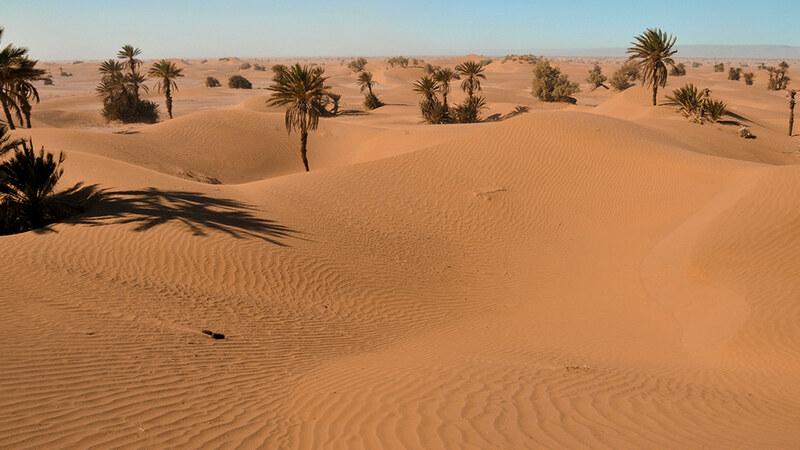 An erg (also sand sea or dune sea, or sand sheet if it lacks dunes) is a broad, flat area of desert covered with wind-swept sand with little or no vegetative cover. The term takes its name from the Arabic word ‘arq’ – meaning ‘dune field’. 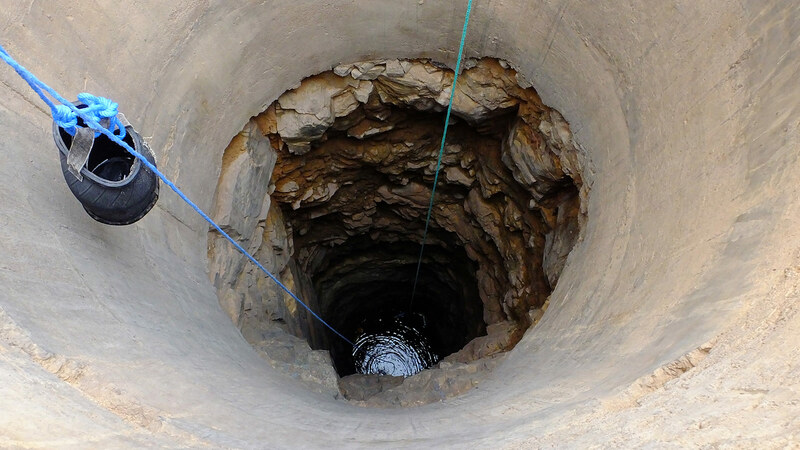 Approximately 85% of all the Earth’s mobile sand is found in ergs that are greater than 32,000 square kilometres (12,000 sq mi).Ergs are also found on other celestial bodies, such as Venus, Mars, and Saturn’s moon Titan. 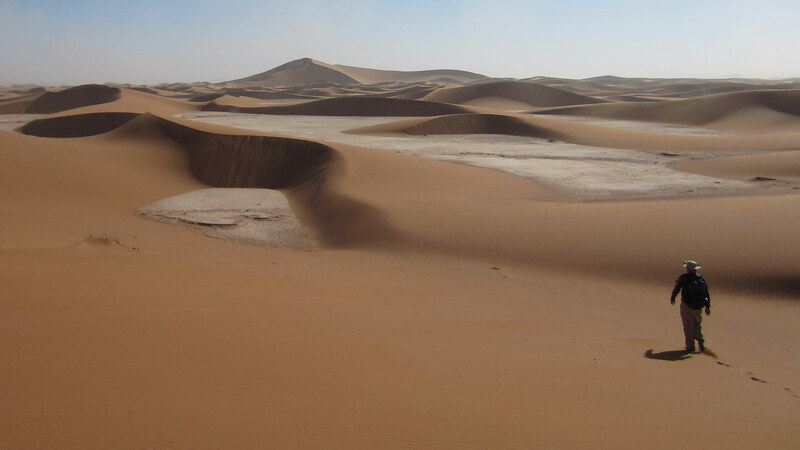 Trek a circular route from/to M’hamid to reach the remote Erg Zahar dune field, little-visited and offering astonishing views from its highest point across the erg. Erg Zahar truly represents a ‘sea of sand’, please click on the Gallery images below to see the unique form of Erg Zahar. 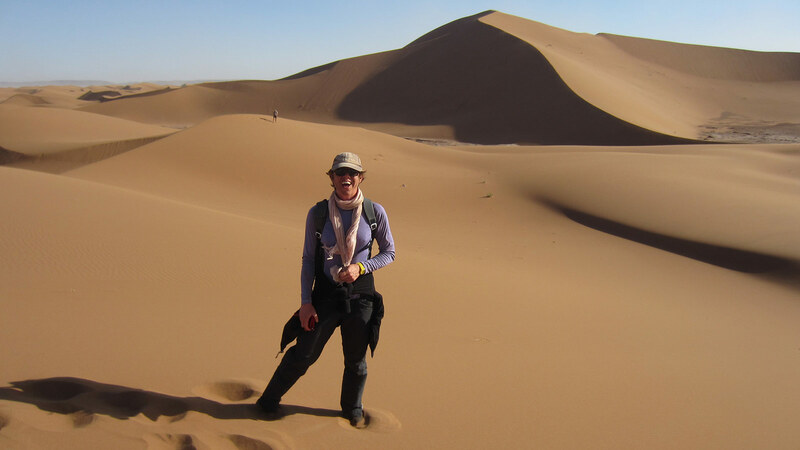 Cross the vast Draa River bed in the heart of the Sahara desert and enjoy the sense of freedom that desert trekking offers. 4×4 transport in the desert is not necessary. 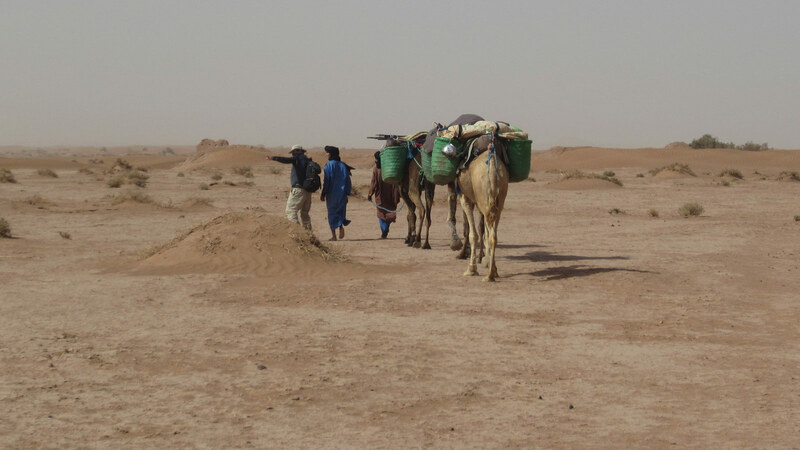 After breakfast, meet your desert guides & camel caravan when the camels are loaded with your luggage / equipment. 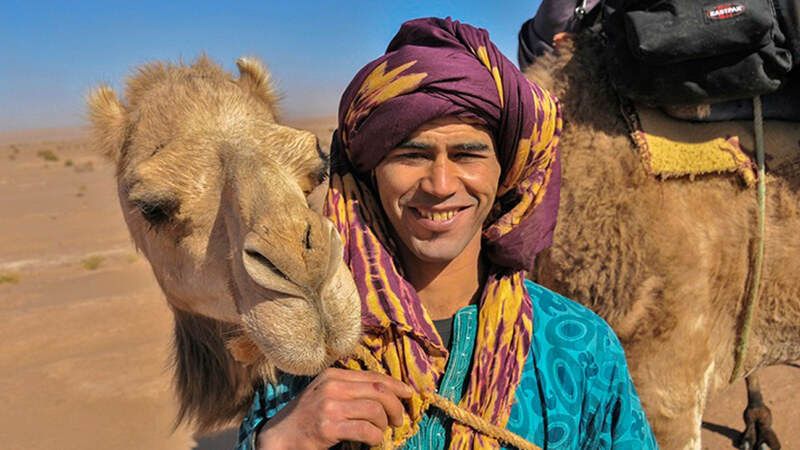 Your guides will also help you to wrap your turban, ideal protection in the desert. 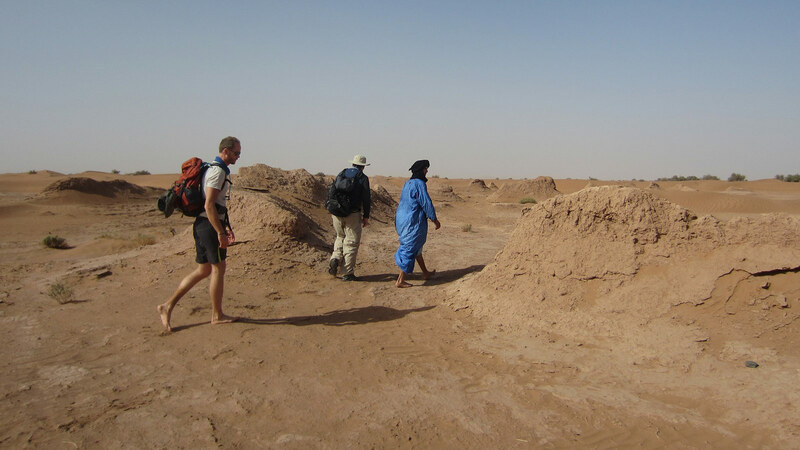 The morning’s trek follows the southern banks of the Draa River, through the vast palm groves and original settlement of M’hamid (purported to be approx. 300 yrs old); take time to visit some of the ancient pise-mud buildings, now abandoned, and enjoy the partial shade offered by the trees. Once at the end of the palm grove, take lunch at a point known as Ras Nkhal. Here, the palm trees open out and give way to desert scrub and stone (hamada), earth banks & tamarisk trees for the rest of the day’s trek. After lunch, continue on a south-westerly course for approx. 2.5 hours towards the marabout (the shrine of a holy man) of Sidi Naji, close to where overnight camp will be established, in the seclusion of small dunes. Today’s trek time: 5-6 hours, depending on the pace of the group. 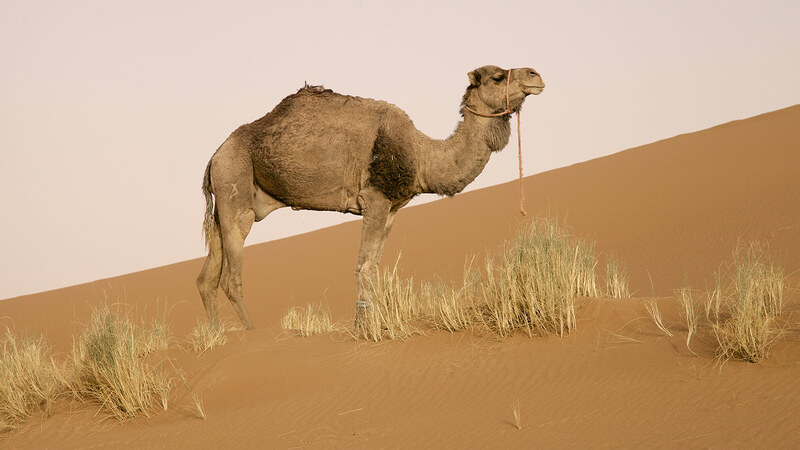 After breakfast, camp is struck, and the day’s goal, the large, remote sand dune region, of Zahar, will be reached before lunch. 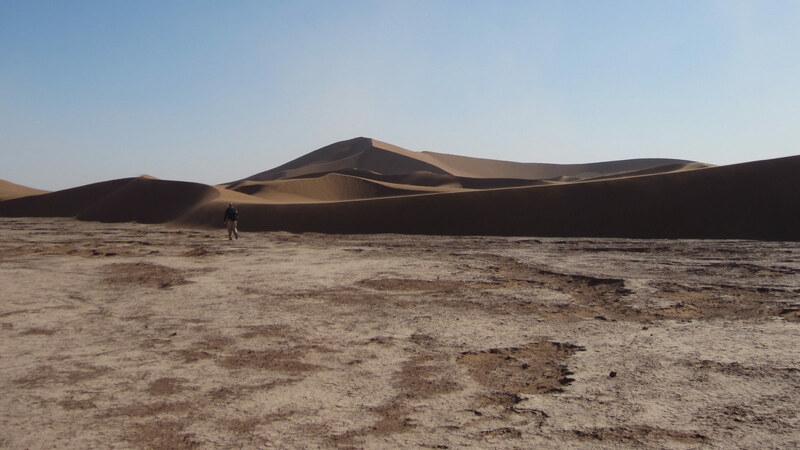 Today’s trekking terrain is largely flat, plateau-like earth (a dried lake) which gradually transforms into rolling sand dunes, with far less vegetation visible today. Camp is established at the foot of the tall dunes, between smaller dunes, and lunch is served. This is a little-visited dune region and your afternoon is given to exploring Zahar, reaching the highest point to enjoy the wide-reaching views across the ‘erg’ (sand sea) and then the sunset. 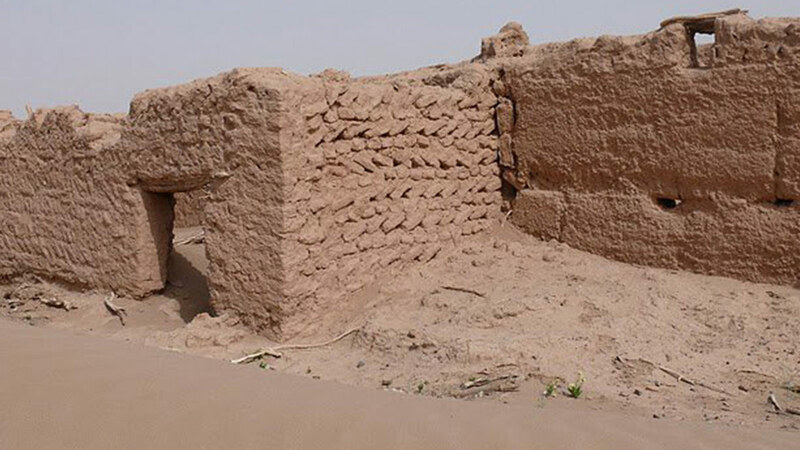 Zahar is also known as the ‘screaming dunes’, for a legend that tells of a village buried beneath the sands there. Today’s trek time: 4 hours, depending on the pace of the group. After breakfast, camp is struck. Today’s goal is the village of M’hamid, to complete your four day circuit. The terrain once more becomes marked by desert scrub and earth banks, and palm groves become more apparent the closer you reach M’hamid. You will break for lunch, in shade, before reaching the village. Today’s trek time: 4 hours, depending on the pace of the group.